Reynolds, GA--April trips for the the Fellow Travelers are usually arranged for the first Thursday, Friday, and Saturday of the month. Since these trips are not strictly week-enders it has often been difficult to assemble a large crowd for the trips. The 2008 trip proved the e xception. It became obvious that enough people would make the trip that the King issued an edict ordering everyone to prepare their own meals. It would have been impractical for one person to carry enough food, cooking equipment, and utensils to feed nearly twenty hungry folks. As it turned out nineteen turned out for the event. The plan was to gather around 9:00 AM at the Flint River bridge on SR 49 between Fort Valley and Reynolds. The weather service predicted the chance of rain at 30% for Thursday and Friday and 70% for Saturday. Art Shelfer, the Fellow Traveler Weatherman, simply predicted that everyone would drown. A misty drizzle was falling to test the resolve of the tough group. Seven rookies made their first appearance with the gang. Greg Ferrell found the website and decided to bring his family up from Shalimar, Florida. Greg, his wife Jeniffer (spelling is unique and correct), his children Ashley (16), Katelyn (13), and Sean (8) brought two Old Town Camper canoes rented from the Air Force. 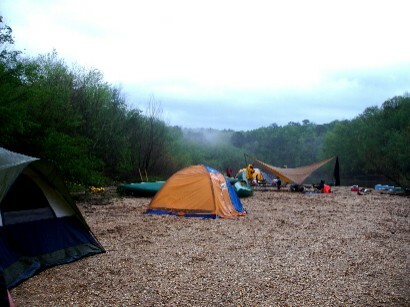 Randy Pettis brought his son, Brendan (15) along and they paddled Charlie’s Penobscot 16. Stan Jones, making his first trip in several years, borrowed John’s Blue Hole canoe and soloed it. Jeanne Hewetson got the high honor of riding with John Williams in his shiny Penobscot 16. Harry Selby flew all the way from California to make the trip and he partnered with Rick Metz in the green Mohawk. Calvin Stines, just home from Iraq, took his twelve year old son, Noah in the green Tripper. Charlie and Diane Stines (age a secret) paddled the Canadienne and took Diane’s Yorkie with them. W.H. Stines came down with Calvin and Noah but decided not to paddle because of the weather. Most of the cars were taken to the tentative take-out at Hook’s Landing on SR 49 near Montezuma and Oglethorpe. John brought the drivers back to the put-in in his bright red diesel Suburban. Loading the boats proved to be a little tricky because of the slick mud. Charlie fell twice and muddied his new economy-grade zip-off pants. It seemed that the pink Crocs just lacked sufficient traction to deal with situation. There were five motorboats taking out as the boats were loaded. The men in those boats were the only people the travelers would see until reaching Crook’s Landing on Friday afternoon. The small navy continued paddling for a couple of hours and then decided to break for about an hour on a large sandbar. Diane fell face first into the shallow and got the Yorkie wet. It took some TLC to get the dog to quit shivering and be a normal dog. The weather had improved from damp to merely dreary and the whole crew seemed to be having a pleasant trip. 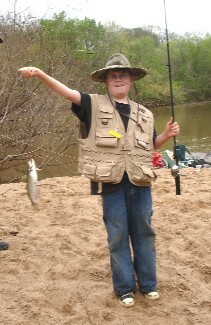 Noah wetted a hook and landed a pretty channel catfish. Rick tried his luck but had none. The Flint has a meandering winding route and this time had a strong current. But there was no really fast water, no pull-overs, nothing to float under, and no bothersome obstructions. T he congregation reached the site of the old ferry about 3:00 PM. The site is just upstream of SR 127 near Marshallville. W.H. was there with Calvin’s truck. The spot was badly littered but it did offer a reasonably suitable campsite. Everyone agreed to camp there and that allowed W.H. to spend the night with the campers. John and Charlie each set up an outfitter wing to provide a place to sit in the event of rain, but they were not needed. By the time the tents were pitched and everyone had sat around swapping a few lies the veterans felt pretty well acquainted with the rookies. There were no community meals. A variety of food was cooked--grilled shrimp, small steaks, a rabbit, some pasta dishes, and heaven knows what else. Once the food was eaten and the dishes washed the group sat around and enjoyed the pleasant temperature. Someone built a nice campfire. Firewood was plentiful because timber had been recently cut. The children supplied most of the wood, but W.H. and someone else dragged a huge piece of log to use as a fire backdrop. It was almost burned up by morning. Charlie was going to cut wood with his high tech folding saw but he had to have Harry show him how to assemble it again. It is sometimes useful to have an engineer along. The youngsters roasted marshmallows. It was a good night for sleeping. Calvin complained about Diane’s snoring and blamed it on Charlie. No one got up before daylight. John and Charlie each prepared a pot of coffee. Once breakfasts were cooked and eaten the canoes were loaded and the Friday float began. W.H. 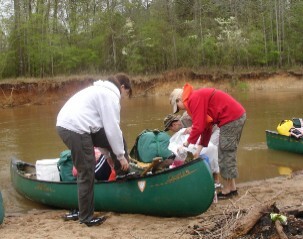 agreed to meet the paddlers at Crook’s Landing and he took most of the camping gear in the truck. Friday was a great day for paddling. The sun peaked from behind the clouds and the sky changed from gray to blue. There were a couple of stops on sandbars. The group reached Crook’s Landing unexpectedly early and everyone was there shortly after 2:00 PM. Crook’s Landing is located in the Montezuma Bluff Natural Area, also called MBNA. It is only four miles upstream from the take-out at Hook’s Landing. (IT is four miles from Hook’s to Crook’s!) There was a large sandbar perhaps a couple of hundred yards upstream from the landing and the crowd elected to carry the tents to the sandbar but to cook at the landing. Once the suppers were eaten and the campers went to the sandbar the weather changed quickly and dramatically. Greg Ferrell had a weather radio and it said that a tornado watch was in effect. It was almost impossible to pitch the tents because of the strong winds. Charlie weighted his tent with two roll-a-cots but it blew away in spite of that. The solution was to drag a log to each side of the tent and anchor it to the logs with ropes. The winds blew with fury and the rains poured. It made the group wary of ever bringing along anyone named Noah again. It seemed the winds might rip the tents to shreds but all survived. The rains ceased before 10 PM. Even the stars were visible. John built a nice fire and it provided a gathering spot. Finally, bedtime came. 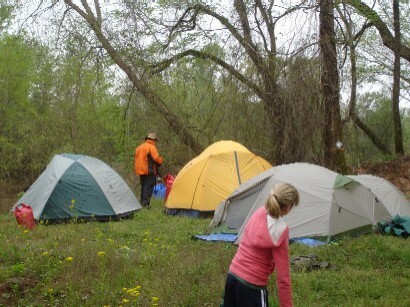 Once inside the tents the group was blessed with a little more rain. At times they were heavy but no one got really wet inside the tents. It was still raining when daylight came. The decision was made to forego the final four miles to Montezuma. John, Jeanne, and Stan did not agree with the decision and decided to finish the anticipated paddle. All the others were shuttled to get the cars and then loaded the boats and gear. The Shelfers had to be driven to the take-out after everyone else had retrieved the vehicles, and John, Jeanne, and Stan were there before the others arrived. It was a fun trip in spite of the weather. The Fellow Travelers the rookies--Greg, Jeniffer, Ashley, Katelyn, Sean, Randy, and Brendan. Perhaps they will become regulars.